serve delicious, affordable food that guests will want to return to week after week. 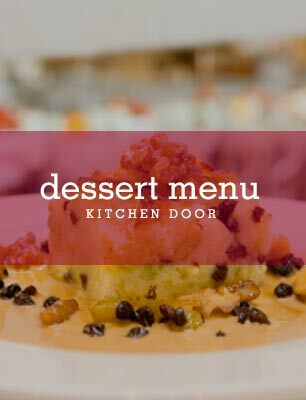 For Kitchen Door, the chef has crafted an ingredient-driven menu of handmade multi-ethnic comfort food, created with local and seasonal products, selected to complement wine regions and meant for sharing. Famed for his forager’s eye, Humphries has stocked his kitchen with local and sourced mushrooms, both fresh and dried - including his favorite candy caps, mousserons, agaricus, morels grilled over wood, and whole roasted porcini. Several of Humphries signature dishes come off the wood fires of Kitchen Door. From the whole roasted rotisserie chicken or just the wings, wood roasted duck bahn mi, grilled korean style short ribs and Lahmajune an Armenian “fold & eat” flatbread baked fresh in the wood oven. Begin with mushroom soup or beef carpaccio and end with candy cap mushroom bread pudding or soft serve ice cream.